Kanbanize 5.2 contributes to the Main Dashboard’s widget arsenal in yet another big way. 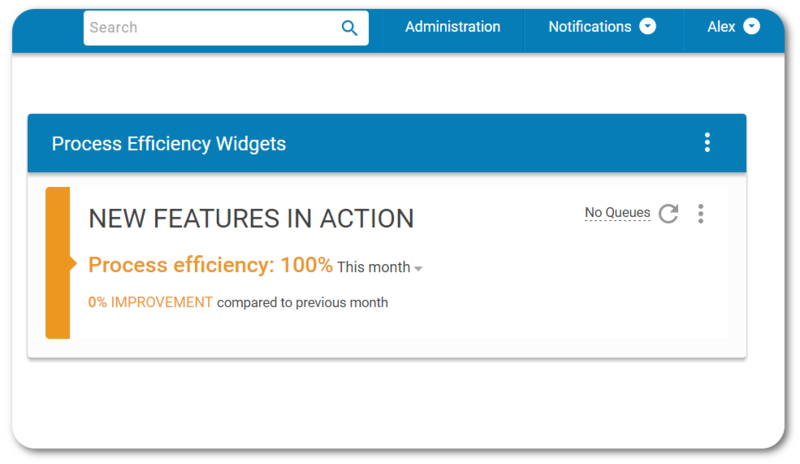 The familiar status widget, arguably the first widget ever introduced to the Kanbanize dashboard more than a year ago, is succeeded by the brand new Process Efficiency Widget. The new formula combines vital data about wait time & blocked time in relation to lead time in order to provide more information about the efficiency of your ongoing workflows across various projects. It calculates the ratio between value-adding time and the lead time required to complete a process. Like the other widgets we have introduced so far, this new addition is highly customizable. It is designed to serve as a motherboard for sub-widgets related to the efficiency of different parts of your processes. Filter what it tracks by selecting the swimlanes or other refined search criteria you would like to include in the calculation for Process Efficiency. The data can be calculated for different periods of time including this week, this month, and others. Unlike other flexible widgets, which can be removed and added at will, Process Efficiency is an intrinsic part of the way you monitor your workflow and will be consistently accessible from its dedicated section in the Main Dashboard. 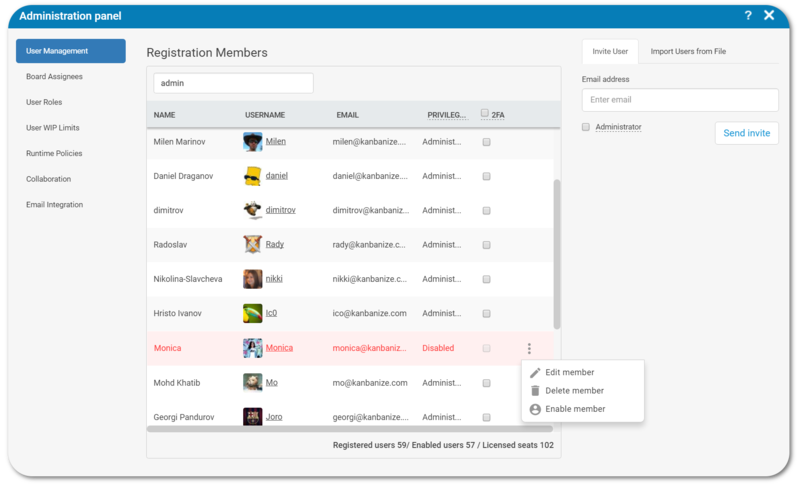 Administrators can now invite as many email addresses as they want to a single Kanbanize account. The number of invitees they are able to activate will be defined by the count of purchased licenses attributed to the account. Users can be disabled and enabled from the “User Management” tab of the Admin Panel by a project manager. Use the settings menu, triggered by hover, to define and redefine the status of any invited email address. The ability to deactivate users instead of deleting them will prove useful in the event of a temporary handover due to a team member’s absence or situations in which active users vary on a project basis, for example. With this new feature, you won’t lose the data for your users, but, instead, can easily switch between them without having to delete anyone. 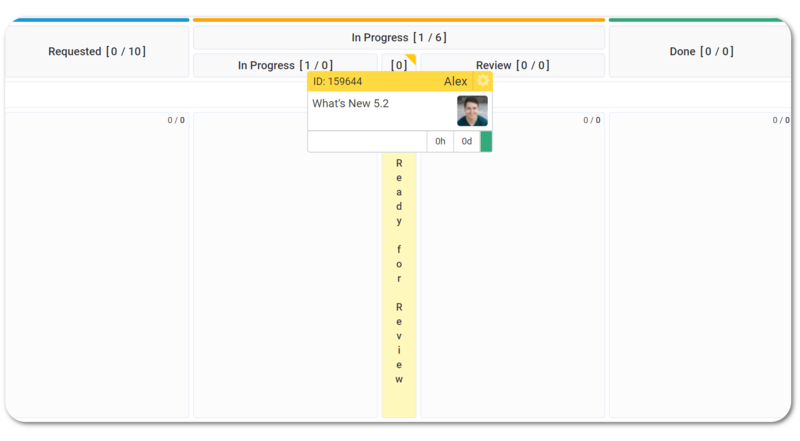 Drag and drop your Kanban cards into open or collapsed columns on your board to move them into the next stage of the process. Even without extending the column, the dropped card will take the last position in the collapsed cell to which you’ve added it. Floating menu for card details is another little enhancement to improve UX. Some cards tend to get extremely big, featuring a great number of comments, subtasks, links, or have many changes listed in the history. The floating card details menu will now follow the user as they scroll through vital information to keep important functions at their fingertips while they work with their cards.